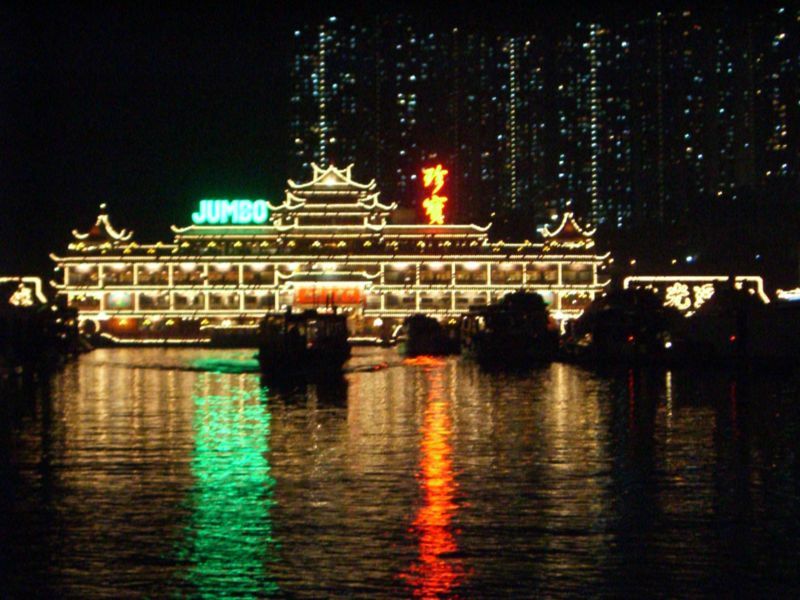 Jumbo Kingdom was established in October 1976 by Dr. Stanley Ho after four years and over HK$30 million were spent to design and build it. It was originally decorated in the style of an ancient Chinese imperial palace. The Jumbo Kingdom recently went through a major multi-million dollar renovation, which transformed it into a theme park on the sea including dining, shopping, sightseeing and cultural attractions. Topdeck: A restaurant and bar located on the topdeck of Jumbo which serves western cuisine. Topdeck is managed by Cafe Deco Group. Dragon Court: Dragon Court is a fine dining Chinese restaurant which serves authentic and innovative Cantonese cuisine located on the first deck of Jumbo. The interior design of the restaurant is a mixture of Ming Dynasty and contemporary Chinese. Cooking Academy: A Chinese culinary school taught by the chefs of Jumbo Kingdom. Sampan Dining: Visitors can experience the nostalgic Hong Kong dining experience from a bygone era, the Typhoon Shelter seafood meal on a sampan.